I spend a fair amount of time searching through old newspapers for obits and other articles of interest on the families I research. While doing this sometimes a bizarre or interesting story catches my eye. An example is the following article, which appeared in the Reading (Pennsylvania) Eagle on Thursday, October 4, 1888. This one speaks for itself! 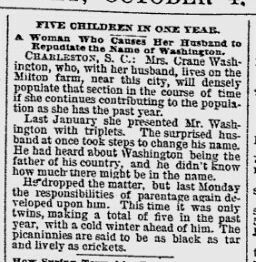 Charleston, SC: Mrs. Crane Washington, who, with her husband, lives on the Milton farm, near this city, will densely populate that section in the course of time if she continues contributing to the population as she has in the past year. Last January she presented Mr. Washington with triplets. The surprised husband at once took steps to change his name. He had heard about Washington being the father of his country, and he didn’t know how much there might be in the name. He dropped the matter, but last Monday the responsibilities of parentage again developed upon him. This time it was only twins, making a total of five in the past year, with a cold winter ahead of him. The picaninnies are said to be as black as tar and lively as crickets. Disclaimer: I am not related to this family and have no further information — just posting an interesting article that caught my eye. I just hope this poor woman had relatives or friends to help her out!